We`ve now crossed the border from Argentina into Bolivia, and this is where we hit altitude. Bolivia only has 5% of its roads paved, we had such a bumpy ride, the truck was rocking all over the place and at some points we were right on the edge, on windy mountain roads - i had to close my eyes. The landscape is so different here, very barron and dusty with crumbly stone housing and we`re right up in the mountains. the people here are far more indigenous and the country is generally less westernised than the previous 2 countries. There are also no toilets in sight so we`ve all got pretty used to weeing behind bushes! We spent two days getting to our first town Potosi, camping on route by the side of the road completely in the middle of no-where with not a sound or light anywhere near. It was so peaceful. The stars were just beautiful, the clearest ive ever seen. The only problem came when we had to put up our tents up on dust, there were just no foundations for the tent pegs. I really thought we were in for our first collapse, but we made it through the night! Potosi is the highest city of its size in the world, at an altitude of 4,070m. Here we all really began to feel the effects of the altitude. Its really bazaar. We all have really dry skin, eyes, nose and lips and all our toiletries keep exploding! It has also become much more difficult to breathe. Just the slightest bit of excercise, particularly uphill, leaves you so breathless. Also water boils at 90degrees - just a little fact for you all! Didnt do too much in this town, needed to take it really easy to adjust to the altitude. There were some great handicraft markets here so spent a lot of time exploring them and getting some warm Alpaca and LLama winter woolies in preperation for our next stop at the freezing salt flats in Uyuni. Just a short drive to Uyuni. 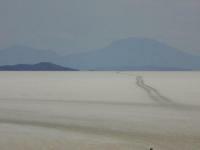 We booked ourselves on a 4x4, overnight tour of the salt flats. We were picked up from our hotel and taken to see how the salt is processed. Next we headed out into the pur white 12km square expanse of Salt. All you could see was whiteness, the glare from the sun was blinding. It was very similar to being on ice, but not slippery. We spent the day taking photos, exploring and climbing various viewpoints. In the evening we headed to the eco - lodge, where we were to spend the night. It was the most basic accommodation yet. Huge concrete floored rooms with multiple beds, no water and the eletricity went off at 9.00pm, it was like being at school camp! The next day we were up at 4.30am to catch the sunrise ove the salt flats. I think i was the coldest ive ever been, we all just darted out of the 4x4`s took some quick photos and dived back in. But it was worth it. Afterwards we drove to a voplcano to have breakfast before embarking on a 3hr hike up the volcano. It was so grueling and i felt so breathless at times but i got there in the end. I looked at it as good training for the Inca trail in just 1 weeks time. As dusk fell we headed back to the hotel for a good wash. I was the grimiest ive ever been. 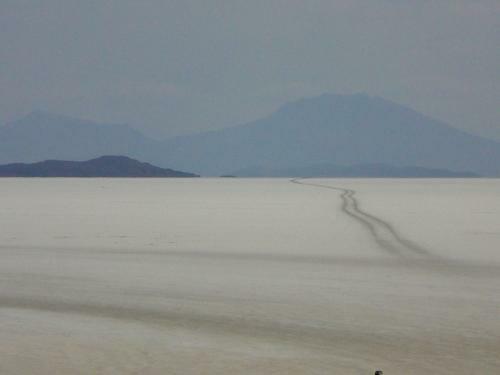 The combination of salt and dust had left us filthy. My feet were black. We were so grateful to be in a hotel bed and we all crashed out really early, to get some much neede sleep before heading to LaPaz.